While this revolution is gaining wide acceptance, BANK llect, a decentralized intellectual bank network that allowing anyone worldwide to participate as a lender or borrower has arrived. BANKllect is a decentralized peer-to-peer bank network. Its main task is to create an unique and new generation bank ecosystem where each its participant will have a possibility to choose a needed bank service and earn on it. The key difference from currently presented crypto bank solutions (Bankera, Polybius, Datarius, Crypterium, Change, etc.) is that BANKllect proposes a series of bank-focused services in the way different from what the traditional banks do. 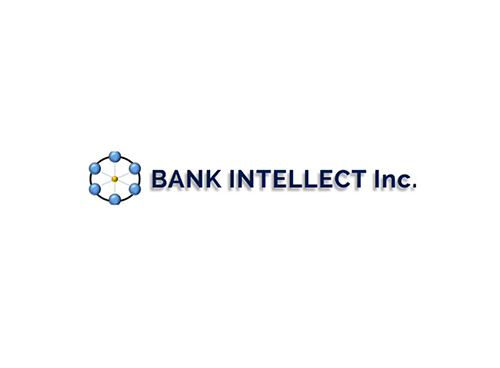 At the heart of BANKllect network is a participant. The participant is an individual or company with or without initial financial capital (fiat money, coins, tokens). Our own technology «Proof of Participation (PoP)» allows the participants to earn money by a degree of its activity in BANKllect network. Eliminate a need for gathering a bulk of client documents. Greatly broaden list of bank services. Clients regardless of their level of income. Give their clients a chance to earn money. Present a great choice of insurance programs. Present a flexible program of client savings. Realize a revolutionary approach to global credit system. As for our strong team's certainty there are two main direction of bank services development in crypto market. The reason for this classification is effected by the fact that the majority of current bank-oriented crypto projects don't focused on methods of client collaboration which are different from traditional bank methods. In contrast to innovative approaches which crypto market can give to their users 99% of projects simply copy the traditional bank's functionality. This kind of projects is incapable of transforming and improving the global bank system because of its initial commitment to traditional bank system through licenses. The bonus programs are specifically designed for a possibility of its investors to get an access to a variety of BANKllect bank products through a usage of sphere tokens. 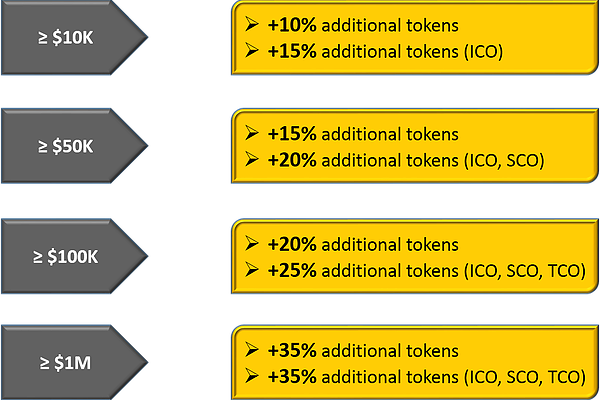 There are four bonus programs for pre-ICO, ICO, SCO and TCO, respectfully. MLS is specifically designed for participants of BANKllect network who, first, would like to earn some money using own cryptocurrency, second, would like to get some money for own needs. VCP is, first of all, designed for development of crypto market. VCP connects both sides, venture capitalists and professionals for a single goal - «Creation of Innovative Products in Crypto Market». In compared with Program of Individual Deposit, PCD connects two or more participants of BANKllect network for the purpose of sharing risks between each participant involved in deposit contract (smart contract). 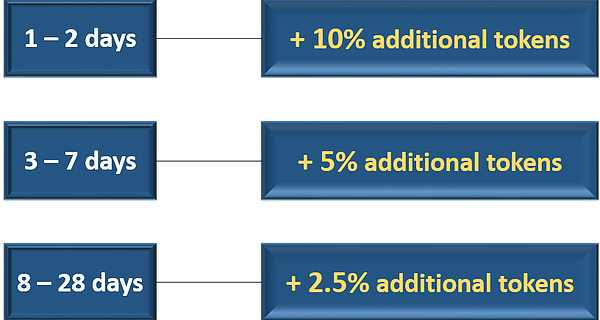 PCD also gives an opportunity for earning extra money through mechanism of collectively accumulated crypto tokens. PID connects one single participant to another single participant of BANKllect network for the purpose of signing a deposit contract (smart contract). SAA is a modern IoT-based methodology of assessments of fiat assets. An object of the assessment can be a property of as an individual as a company. The main goal of SAA is tokenization of the assets. MES will let do an exchange from any cryptocurrency that is presented on crypto exchange. The exchange can be done as for other cryptocurrency as to fiat. Equal conditions of collaboration between participants of BANKllect network. SIS determines a series of rules of participant collaboration. SIS gives an unique possibility for participants of BANKllect network to themselves establish norms and rules during the process of signing (accepting) of a single-side or multi-side smart contract. The participants will be able to themselves track and control as the activity of BANKllect bank as the execution of smart contracts. System of analysis of participant activity. System of analysis of participant activity is based on an advanced technology of multilayers Rosenblatt perceptron. It allows not to only identify direct actions of participants such as money transfer, debit of participant wallet, credit of participant wallet, loans of any kind, but indirect actions such as relationship to financial bank deals. Algorithm of cross-referenced identification is based on methodology of directed graph. The algorithm allows to practically identify any participant with minimum initial data about his or her activity. At the heart of CGS lies a flexible system of client classification. 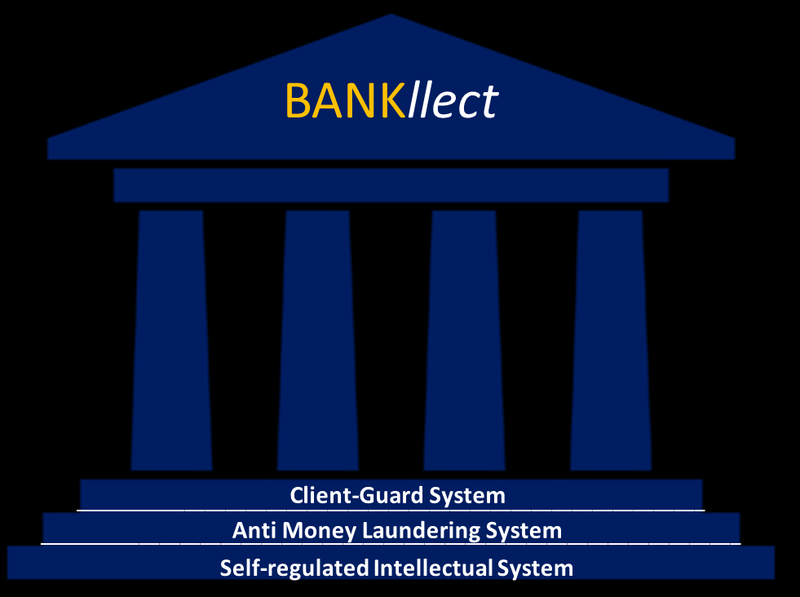 The system allows each participant of BANKllect network to decide what kind of his or her personal or business information will be public or not. 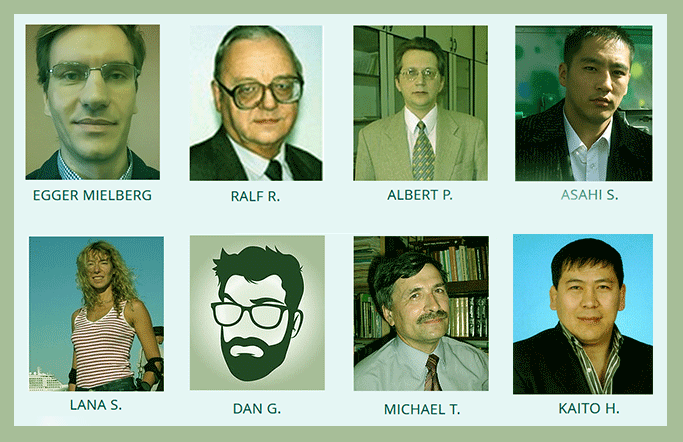 CGS gives an unique possibility for participants of BANKllect network to save their most important information in cryptographic BANKllect bank cell. BANKllect bank proposes an official guarantee of safety of participant cell. Moreover, insurance of cell entry will be included.